The highlights of North America's spectacular West Coast is here for you to experience during this 15-day trip through the US and Canada. Your trip will begin with a flight to Vancouver and land tour of Canada's most majestic national parks and mountains. From Jasper and Banff, you'll make your way toward's Seattle for a picturesque 7-night cruise. Star's Princess will take you through Alaska's Inside Passage for an up-close look at the glaciers and natural beauty of the region. Upon arrival in Vancouver, transfer to your hotel in downtown Vancouver. The remainder of the day is yours to explore Vancouver at leisure. Blessed with a spectacular Pacific Rim location, Vancouver is a study in contrasts and cohesion. Depart from Vancouver and drive through the farming communities of the Fraser Valley. Ascend into the Coastal Mountains and follow the Coquihalla Highway to Kamloops, in the arid interior of British Columbia. After lunch, retrace the route of the famous Overlanders along the North Thompson River to reach your hotel in Jasper. Your day starts with a scenic hike through Maligne Canyon before heading South. Then, travel along the world-famous Icefields Parkway to take in some of nature’s most spectacular mountain scenery. Have your camera ready for possible wildlife sightings! Highlights include Athabasca Falls, Peyto Lake, and the Columbia Icefield. Ride the “Ice Explorer”* on Athabasca Glacier or visit the Glacier Skywalk*. Enjoy a full day of sightseeing in Banff National Park. 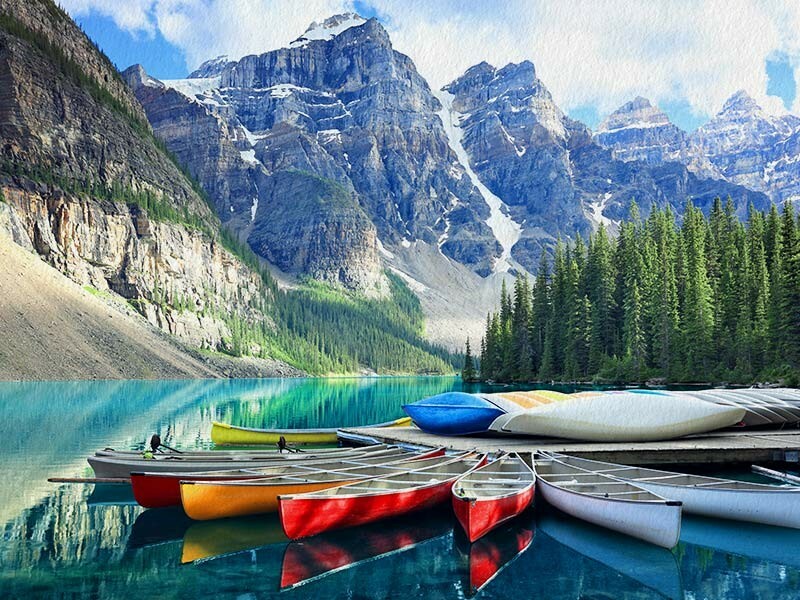 Start your morning with a leisurely hike in Johnston Canyon and stroll along the shores of picturesque Lake Louise and Moraine Lake. In the afternoon, visit the world famous Banff Springs Hotel and Bow Falls. With your free time in Banff, you may also choose from optional activities such as soaking in the natural spa at the Upper Hot Springs* or taking a gondola ride to the top of Sulphur Mountain*. Transfer from Vancouver to Seattle cruise terminal to check in for your Alaska Inside Passage Cruise on Star Princess. A traveller's first view of this Inside Passage port town may be of a boat-filled harbour enveloped in snowcapped mountains. The rustic city of Ketchikan has been called the totem pole capital of the world. Tours show off the city's streets, restored from the pioneer days; the harbour's salmon canneries; and the world's oldest collection of totem poles at the Totem Heritage Center. Sportfishing, kayaking, hiking, bear watching and Misty Fjords seaplane excursions are also popular. Your Alaska cruise arrives back in Seattle, transfer to Seattle airport for your flight home. Children must be at least 7 years of age to travel. Children from 7-10 years receive a 10% discount. Children must be accompanied by a responsible adult 18 years old and over to travel. No unaccompanied minors are allowed. The additional supplement for a single traveler is $2099.